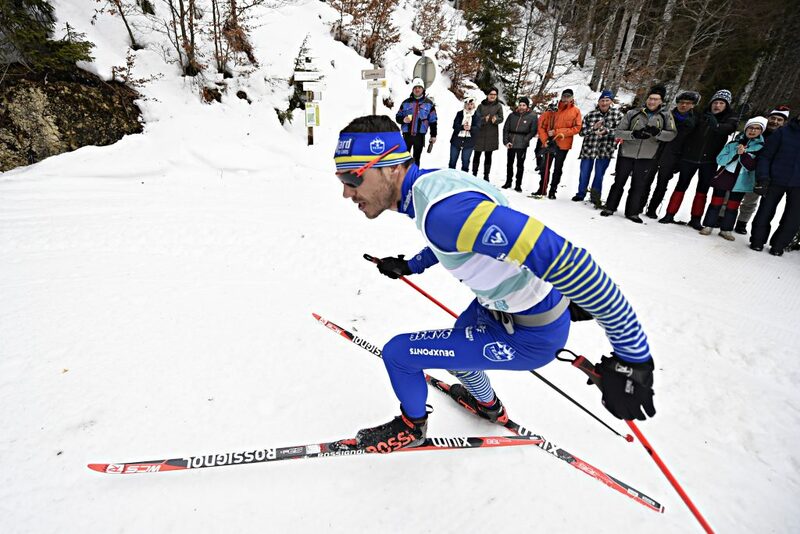 After some years the La Transjurasienne, biggest cross-country skiing race in France, could return to the original course between Lamoura and Mouthe. Today the 68 km long skating race was hosting the FIS Worldloppet Cup stage 4. That means, not only the best marathon skiers of France were competing, but also a strong international elite group. But in the finish, the local heroes were celebrating. In total over 2000 skiers took off in the morning in Lamoura and started their journey over the mountains of Jura, with 68 km to go to the finish in Mouthe. Eventhough the tracks have been fast and temperatures have been mild, the race became very hard because of strong wind. Only on the first kilometers of the race we have seen a leading group working together, until the first skier became impatient. Agnelle Gerard (FRA) who was skiing in the red bib as FIS Worldloppet Cup overall leader, started the first attack already after 10 km. But when the group catched him again, it was Robin Duvillard, who started a counter-attack. Successfully. Imediately he brought 30 seconds between him and the leading group and never looked back. He made a one man show out of his home race, celebrated by thousands of spectators along the course and especially on the finish lane. It seems like he had no problems with the wind today and kept speeding and speeding. As long as he entered the finish lane in Mouth, where he celebrated his last meters before he got the obligatory cowbell as the winner of Transjurasienne 2019. The winner time was 2:28:41. Five minutes after Robin Duvillard another two French skiers battled for the second and third place. Agnelle Gerard (red bib holder) & Benoit Chauvet were skiing and working together, but of course only until the last meters. A few hundret meters before the finish, Agnellet started to attack Chauvet and he had success: Agnellet could finish second right in front of Chauvet, who is happy with his 3rd place. Agnellet today had some bad luck with a crash, which cost him at least one minute to the leading group. So he had to put big effort into chasing the group and in addition, “my drinking belt broke at this accident so it was a total mess for me. I always had to adjust the drinking belt!”, says Agnellet. The big favourite for today, Maria Gräfnings from Sweden, current leader of the FIS Worldloppet Cup, had to stay at home after being sick. So another french victory today was secured by Anouk Faivre-Picon. With a time of 2:51:55, she finished 2 minutes and 16 seconds before her compatriot Celine Chopard-Lallier, who surprised with her 2nd place. Also, the third place in the ladies race is going to France, namely to Alicia Choron, who finished 6 minutes behind the winner. Tatjana Mannima from Estonia, who started as second place in the FIS Worldloppet Cup overall ranking, had troubles to follow the French skiers and was complaining about slow skies. Anyhow she managed to finish 4th. Oh that was a good race. It was a dream for me to start in Lamoura, at my home race. I remember back in time, when I was a young child, standing there and cheering. And now all this people are cheering for me! I am so happy to finally have the bell and the victory! In the FIS Worldloppet Cup overall ranking, Agnellet Gerard is expanding his lead to 37 points before the second placed Bastien Poirrier. Only two points behind Poirrier Loic Guigonnet and Benoit Chauvet are sharing the 3rd place with 150 points. So the overall ranking is still very close. In the ladie’s over all ranking we still see Maria Gräfnings on top of the podium. Only Tatjana Mannima, who is second, was able to reduce the difference between her and Gräfnings down to 90 points. So already after the next FIS Worldloppet Cup race everything can change. The FIS Worldloppet Cup is going to continue next weekend in Estonia with 63 km of classic style, the Tartu Maraton, taking place on the 17th of February.